Notre Dame offered 2020 Fort Bend Austin (Texas) receiver Troy Omeire‍ on Monday and the 6-foot-4, 190-pounder could end up being one of the top players in the country. Omeire, who trains with receivers coach Justin Allen at All-En Sports, is drawing similarities to another long but athlete receiver. “He’s the real deal. He kind of reminds me of AJ Green, but a little more physical,” Allen told Irish Sports Daily. “He could be one of the top players in the country. He’s 6-foot-4, but he moves like he’s 5-foot-10. He has the bend and understands leverage. He’s a very physical kid off the line and a physical blocker. Troy is just a physical player upon contact and has strong hands to go along with great jumping ability. 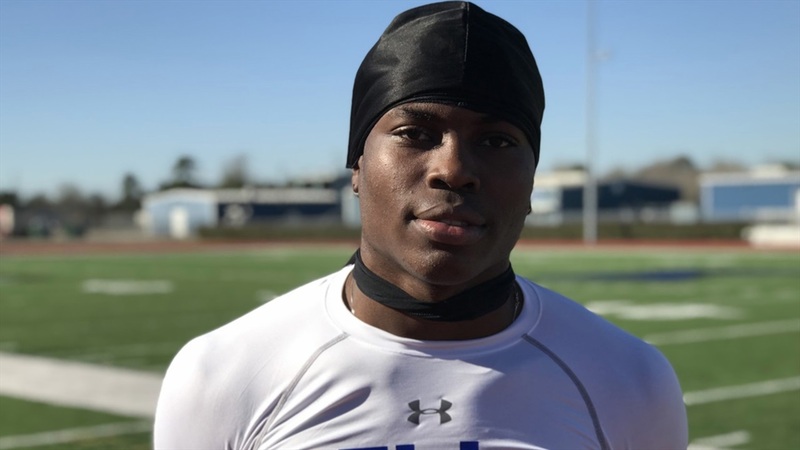 The combination of athleticism, size and speed has made Omeire one of the nation’s most coveted receivers as he holds over 20 offers from the nation’s elite. The untapped potential in his game excites Allen as he began to mold the four-star prospect over the last year. “He’s only had not even a year of receiver coaching and training,” stated Allen. “He’s been playing off pure athleticism. I’ve just started breaking his game down and working on the fundamentals of the game with him for less than a year. In 2018, Omeire recorded 47 receptions for 782 yards and 13 touchdowns and Allen only expects those numbers to rise in 2019. “He’s a gamer,” Allen said. “His understanding of the game is natural. You can’t teach his feel for the game. I’m teaching him the fundamentals that will help him have more of an advantage over his opponents. When we break it down and he understands why he’s doing it, it’s a whole different ball game. Off the field, Allen compares Omeire to a name Notre Dame fans will definitely know as he worked with tight end Brock Wright in high school and in the offseason. “I think he’s one of the kids who has his recruitment open to anyone. He loves the game of football and wants to put the best opportunity to succeed on and off the field. He’s like Brock Wright, who I trained coming out of high school.